Line an 8×8 pan with parchment paper. Set aside. Using a medium-sized saucepan combine white chocolate chips, condensed milk, molasses, and butter. Begin heating the saucepan over medium heat. Stir frequently until butter and chocolate chips are completely melted. Continue to stir until ingredients are completely combined. Stir to add the vanilla and all spices, stir well. Set the 8 X 8-inch pan on an oven mitt while pouring in the fudge mixture. Set aside. 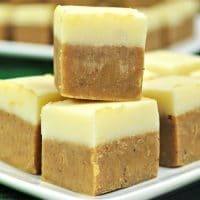 Allow fudge to cool at room temp for several hours or in the refrigerator for 1-2 hours to cool completely. Combine the white chocolate and sweeten condensed milk together in the top half of a double boiler and melt . Pour the white chocolate layer on top of the harden gingerbread layer. Put in the refrigerator for several hours or allow to set overnight before serving. Uneaten fudge can be stored at room temperature in an airtight container.